Affordable Carpet Cleaning knows how important your home is to you. That’s why we want your trust for all your cleaning requirements. 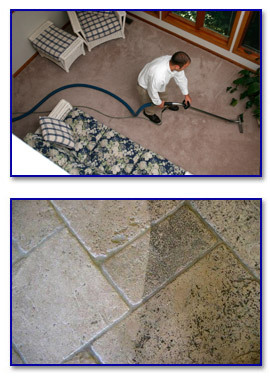 We offer carpet, upholstery and tile & grout cleaning services in the greater San Diego area. We also provide other services such as flood repair and pet odor removal. Is that a spot or a stain on my carpet? Spot: A discoloration from a dissolvable (or removable) substance that is lying on or adhering to your carpet fiber, but has not affected the fiber or dye. Stain: A discoloration from any substance that has adversely (sometimes permanently) affected the fiber or dye. Affordable Clean Carpet Service preconditions all of the carpet and extracts the water and contaminants using a neutralizing fiber rinse. Just like washing laundry you wouldn’t skip the rinse cycle would you? So you wouldn’t want to skip that when having your carpets cleaned! We include general preconditioning and disinfectant and finish with a fiber rinse. Our aim in cleaning your carpets is to restore it as close to its original condition as possible. Our cleaning methods include a pre-treatment, spotting and steam cleaning. If there are heavy traffic lanes or areas that need extra attention, we will scrub to ensure the best carpet cleaning possible. (Scrubbing is an additional charge). We practice NO SURPRISES and NO FINE PRINT, so let’s address “How much is it going to cost to clean my carpets and what’s included? The following are some factors that affect pricing so the more information you give us the more accurate our estimates will be. Our qualified carpet cleaners are well trained in treating the toughest of stains and ground-in dirt. We use only the best quality environmentally friendly products for Carmel Mountain to ensure the safety and highest level of protection for your investment and our environment. We also specialize in cleaning more than just carpets. We have equipment and staff to handle upholstery and tile & grout. Our other professional services include Air duct cleaning, area rugs and flood work. Let us handle all of your cleaning needs.